In November 2015, Section 1, Duty to Refer, was revised for the purposes of clarity. When there are concerns about Significant Harm, then the contact must be made immediately. The greater the level of perceived risk, the more urgent the action should be. The suspicion or allegation may be based on information, which comes from different sources. It may arise in the context of the Family Support Process. It may come from a member of the public, the child concerned, another child, a family member or professional staff. It may relate to a single incident or an accumulation of lower level concerns. The information may also relate to harm caused by another child, in which case both children, i.e. the suspected perpetrator and victim, must be referred – see also Abuse by Children and Young People who Display Sexually Harmful Behaviour Procedure. The suspicion or allegation may relate to a parent, professional, volunteer or anyone caring for or working with the child – if so, see also Allegations against Persons who Work with Children. Contact must be made even if it is known that Children’s Social Care Services are already involved with the child/family. If you know the name of the social worker/practitioner, Customer Services can connect you to that person/team. If the case is open, the allocated social worker should be contacted to discuss new concerns arising. Alternatively advice may be sought from a Designated Senior Person or Named Professional from within the referrer’s own agency. Where an agency, organisation, or worker has concern for the welfare or safety of a child they should contact CADS by telephone on 0344 800 8021. Your call will be answered by a Consultant Social Worker, and alongside our early help Pathway Advisors and partners, we will make sure the child gets the right support first time. CADS will undertake further information gathering about the child and their family from relevant agencies and their own multi-agency records, and from this combination of information will make a decision as to whether the case needs to be referred to the Assessment Team for a Social Work Assessment. If the child is suffering from a serious injury or requires treatment, medical attention must be sought immediately by calling an ambulance or taking the child to the Accident and Emergency Department of the local hospital. The duty Consultant Paediatrician must be informed of the nature of the concerns and contact must be made in accordance with this procedure as soon as practicably possible. A teacher, foster carer, childminder or any professional should, for example, take all reasonable steps to offer a child immediate protection from an abusive parent. Where abuse is alleged, suspected or confirmed in children admitted to hospital, they must not be discharged until contact has been made with CADS in accordance with this procedure and a decision made as to the need for immediate protective action. No child known to Children’s Social Care Services who is an inpatient in a hospital and about whom there are child protection concerns should be discharged home without contact with CADS to establish that the home environment is safe, the concerns by medical staff are fully addressed and there is a plan in place for the ongoing promotion and safeguarding of the child’s welfare – for further information about children in hospital, see Section 6, Children in Hospital of Children Living Away from Home (including Children and Families living in Temporary Accommodation) Procedure. The overriding consideration must be the protection of the child – for this reason, absolute confidentiality cannot and should not be promised to anyone. Wherever possible, Children’s Social Care Services workers receiving referrals from members of the public should respect the referrer’s request for anonymity. However, referrers should not be given any guarantees of confidentiality, as there are certain limited circumstances in which the identity of a referrer may have to be given e.g. the Criminal or Family Court arena. The referrer’s request for anonymity must be recorded. NB – Referrals made by professionals can never be anonymous. Explain that the information will be passed to CADS and/or the Police. No enquiries or investigations may be initiated without the authority of CADS or the Police. Professionals should seek, in general, to discuss concerns with the family and, where possible seek the family’s agreement to making a referral unless this may, either by delay or the behavioural response it prompts or for any other reason, place the child at increased risk of suffering or likely to suffer Significant Harm. A decision by any professional not to seek parental permission before making contact with CADS must be approved by their manager, recorded and the reasons given. Where a parent has agreed to a referral, this must be shared with CADS at the time of calling. Contact regarding any children living or found in Norfolk can be made by calling CADS on 0344 800 8021 where your call will be answered by a Consultant Social Worker. Calls can also be made in an emergency outside of office hours by calling the Customer Services Centre on 0344 800 8020. The call will be put through to the Emergency Duty Team. Alternatively, in an emergency, the Police should be contacted. In the event that an agency does not agree with the response and decisions about the referral by CADS, the referring agency should discuss their concerns directly with the line manager of the social worker, in the first instance to seek resolution. See also Resolving Professional Disagreements Procedure, Resolution Process. If the child is known to have an allocated social worker, contact should be made directly to the allocated worker or, in her/his absence, the manager or a duty worker in that team. If the concern arises out of office hours, contact must be made to the Emergency Duty Team. Any work undertaken by the Emergency Duty Team will be passed over to the active team/worker. In cases where the child is not active this may need to be completed by the regular office hours’ of CADS. If it is not possible to contact the CADS office, the concern must be reported via the Police. If the Police receive a referral prior to CADS, they must consult with CADS as soon as practicable and prior to taking any action. The Police Child Abuse Investigation Unit and CADS work closely together to ensure that children receive the right service at the right time. Professionals in most agencies should have internal procedures, which identify Designated Senior Persons or Named Professionals – managers or staff, who are able to offer advice on child protection matters and decide upon the necessity for contacting CADS. Consultation may also be required directly with the Police or the allocated social worker in Children’s Social Care Services. Arrangements within an agency may be that a designated person makes the contact. However, if the designated or named person is not available, the contact must still be made without delay. Contact or any urgent medical treatment must not be delayed by the unavailability of designated or named professionals. Children’s Social Care Services will ensure that all child protection referrals are responded to by CADS between the hours of 8am and 8pm. Further details on CADS procedures may be viewed in the Norfolk Children’s Services Procedures Manual, Initial Contacts and Referrals Procedure. Outside normal working hours, the Emergency Duty Team will receive calls. If the contact relates to a situation in which a crime has or may have been committed, including sexual or physical assault or physical injury caused by neglect, it will be discussed in CADS with the multi-agency partners co-located there (Police and Health). The Police Children’s Social Care Services, Health and any other agencies involved with the child, will have a strategy meeting to consider whether there should be a criminal investigation and/or a Children’s Social Care Services led intervention. If the situation relates to a child who has an allocated social worker, they will need to make contact with the Police based in the MASH to have a Strategy Discussion. The Children’s Advice and Duty Service will decide upon and record their next steps of action within one working day of receiving a contact. 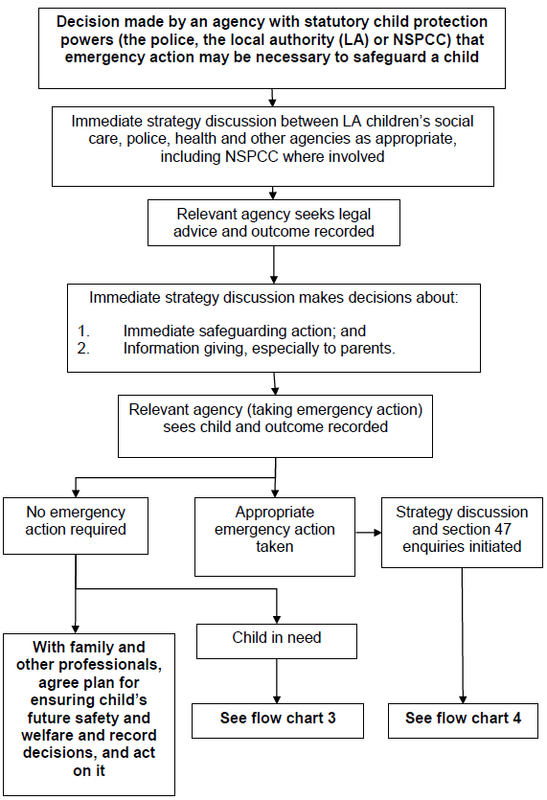 The decision about future action will take account of the discussion with the referrer, consideration of information held in existing records and discussion with any other professionals or services as necessary (including the Police where a crime against a child may have been committed – see Section 9, Where there is or may be a Crime Committed). Is the alleged perpetrator likely to pose a risk of suffering or likely to suffer Significant Harm to this or any other children? Also see Flowchart 2: Immediate Protection (Working Together 2018). Where a child/ is or children are afforded immediate protection by an Emergency Protection Order or Police Protection the local authority has a duty to initiate Section 47 Enquiry. Where agencies or individuals anticipate that prospective parents may need support services to care for their baby or that the baby may be suffering or likely to suffer Significant Harm, contact with CADS must be made as soon as the concerns are recognised. See also Pre-Birth Protocol. Any other concern exists that the baby may be suffering or likely to suffer Significant Harm, including a parent previously suspected of having Fabricated or Induced Illness in a child, or a prospective parent who has been the subject of fabricated or induced illness as a child themselves. Concerns should be shared with prospective parent/s and consent obtained to refer to CADS unless this action in itself may place the welfare of the unborn child at risk e.g. if there are concerns that the parent/s may move to avoid contact with social workers or other professionals. Where the outcome of the contact is that the child is in need of support services rather than safeguarding, the child should be referred to the appropriate service using Norfolk Family Support Form the with the parents’/carers’ involvement and agreement.